So today's post is a bit of an unusual one. 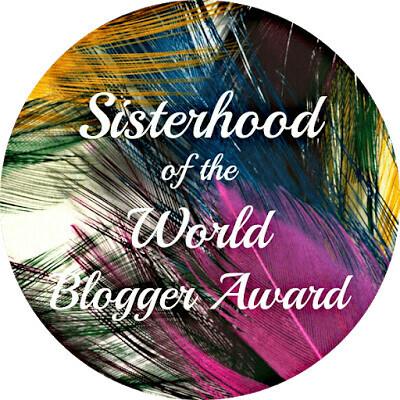 Not only am I posting on a Wednesday, but more importantly, I am doing the 'Sisterhood of the World Blogger Award', for which I was nominated and tagged by the lovely Amanda over at amanda-speroni. You can read her nomination here. I'm actually really really happy about this, since it's bloggers nominating other bloggers they think deserve some recognition (well, at least that's what I'm telling myself), as well as them and readers getting to know each other better. Right, so now that's out of the way, I'll answer Amanda's questions to me! Hmm, well I was reading beauty blogs left, right and centre, as well as spending money on all this skincare and makeup with no-one to gush to about them. My friends are interested in beauty, but not to the slightly manic levels I do, and blogging seemed like a good idea to get my feelings and thoughts about things out there, and possibly find other people who wanted to chat with me about the same things. There's quite a few people I admire, but the two that just jumped to my mind are Diana Wynne Jones, who has been a favourite author of mine since I was a small child, and is in my opinion, one of the best British writers we've ever had, plus one of the few females to have really really made a name for herself in the fantasty world (yes I'm a geek). She even had one of her books adapted into a Miyazaki film, and frankly, that just astounds me. It's difficult enough to try and translate different cultures, so to have a film made of your book by such a famous Japanese studio is amazing. The second person to jump to my mind is Angelina Jolie. I have a bit of a girl-crush on her; not only is she beautiful, generous and very true to herself, she is staunchly dedicated to helping those who have been affected by the horrors of war and poverty. I've always been a fan of hers since I can remember, and it really doesn't surprise me that in a survey this year, she came out the top most admired woman in the world. A perfect day firstly starts off with me not having to wake up at 7am, because I am a terrible morning person! I would wake up at 9 or 10 in the morning, have a spot of light breakfast before heading out for a run. Obviously I'd need to come home to spruce myself up after this, so I'd have a relaxing bath and get ready before heading out. I would have to go visit the British Museum, because this has always been a favourite place for me, I could literally spend a whole day here! After wandering around for a bit, I'd head out to Bea's of Bloomsbury which is my favourite place for afternoon tea. If it's summer, I would then head to Regent's Park to relax in the afternoon sun, take in the flowers and greenery. For dinner, I'd either head to a Japanese restaurant near my part of Camden, or else go to Carnaby Street. If Liberty is still open at this point, I'd definitely pop in and have a little browse around their beauty and perfume section. After dinner, a short stroll around Soho to walk off dinner and make way for dessert would take me to nighttime tea and cake at Princi, before heading home to bed. Ahh, that would be bliss! Well obviously, it would be absolutely amazing to turn blogging into a full-time gig, but what I currently see as my dream job is owning and managing a company like Cult Beauty that specialises in bringing Asian skincare and makeup to European countries. What is your all time favourite book and movie? Can I cheat and have two books please? Honestly, I'd have more if I could, but if I absolutely must, I can narrow it down to two. No make that three. They'd be American Gods by Neil Gaiman, Night Watch by Terry Pratchett and Howl's Moving Castle by Diana Wynne Jones. Oh no, I just thought of two others I'd add to my list. Arrrgh. Film wise, I'd also have to narrow it down to two. Sorry, you just can't ask me to narrow it down to one, I need at least two to get the different feels! One would be Stardust, because it is such a sweet and uplifting film. The other would be Red Cliff, which could technically be counted as two films because it was so long and had to be split in half. This has epic music and sweeping scenery, so fulfills my need for grandscale films. There would be loads more for both these categories, but these are the ones I am always happy to switch on and watch/read over and over again. Hmm, that's a very difficult question for me as I don't even know where I'll be in 1 years time! Can you come back and ask me again in 5 years? On a serious note, I think that I will have achieved my goal of owning a house to call my own, even if it is a small one. I hope possibly to go back into academia, but that is still something I am deciding on. What are your top three blogs that you follow? Viviannadoesmakeup, Gh0stparties and Lily Pebbles. No thought needed. I have recently discovered Park & Cube, and have fallen in love with Shini's blog, because the layout, presentation and photography are just so ridiculously impressive. What are your favourite social media apps? Instagram first and foremost, just because a picture speaks a thousand words, and it's so addictive! Closely followed by Twitter, I love the immediacy of the chats and how genuinely nice people are on there. What are your top tips for people just starting out as bloggers? I'm still very new at blogging, but I do have some tips: get yourself onto Twitter now, if not yesterday. Don't be scared of it as I was, it is one of the most powerful tools you will have for getting your blog name out there, as well as 'meeting' new people and getting blogging advice. I was honestly scared of using it, but now totally regret not getting on with using it properly earlier! Also, be aware that blogging takes up a lot of time! If you don't have a lot of time you can set aside for blogging, don't aim to do loads of posts. It's better to cut the number of posts and focus on writing content you are proud of writing, rather than rushing to get things out. It'll make you feel more organised and in control. Producing good content takes proper time and investment. Know what you can fit in. You write and run your blog, not the other way round. Thank you for reading this post! I hope you enjoyed it! It really made me think, and I hope you felt you got to know me a bit more. If you do your nomination, please let me know so that I can be really nosy and read, I'm looking forward to reading! Hahahaha the twitter fear! Love this! I think bringing Asian brands to the rest of the world is an amazing idea as I am obsessed with Japanese skincare and would love it to be more accessible. I think Amanda asked you some great questions. She's awesome!